Viewers Against Only-Dubbed Films! | personal.amy-wong.com - A Blog by Amy Wong. I am NOT against dubbing… I have read that some people with viewing difficulties prefer watching dubbed films, and I respect that. This is why I’m titling this “Only-Dubbed,” I don’t have a problem with dubbing a movie, but what bothers me is not having the option of watching the subtitled version of it. Case and point, Disney. I love animation, but Disney only releases dubbed-versions of their animated films here… and sometimes, they only release dubbed-versions of their live action films as well. So you see, I just find it a little bit weird to watch Amy Adams with someone else’s voice on Enchanted‘s Disney Latino’s dubbing for Encantada. Lucky for me, the latest Pixar Disney production of WALL*E doesn’t contain much dialog, but it is kinda frustrating to know that I don’t have the option of watching the original audio. However, I have to admit that Disney Latino’s dubbing is not mediocre. In fact, watching the dubbed version of Ratatouille was better than I was expecting, as well as Monsters Inc. Nevertheless, sometimes the dubbing doesn’t work as well, as it happened in their dubbing of Finding Nemo, which I have enjoyed a lot in English, partly because Ellen DeGeneres and the other actors were so good… or The Incredibles, which I totally despise in Spanish. It is a WHOLE other business with English dubbing though, especially for Japanese animation. I have had the luck to grow up watching Japanese animation like Saint Seiya, Dragon Ball… and even InuYasha, so when I arrived in North America, it was a pleasure to get to watch some of those episodes on TV once again. I was horrified when I heard the shows in their English dubbed, but refused to believe that dubbing could be so bad, so when I bought Anime DVDs I decided to try their English audio option. Sadly, I was still horrified. I don’t know if the dubbing industry is underdeveloped in North America, compared to other countries, because there is so many more films, and shows that get made there and distributed worldwide than productions that get done outside and distributed in North America. Of the many films I have gotten to see in their original and dubbed versions, I can probably say I have liked just a handful… the handful that got dubbed with actors like Gillian Anderson, or their original voice actor in another language. Not all star-studded dubbing is good though, and being forced to watch the English dubbed version of some Miyazaki films in the cinema was a dreadful experience. So… if you are a purist, and prefer subtitles over dubbing, or feel like me thinking it’s just weird. Feel free to leave a message =D comment, voice your opinion… even if you prefer dubbing over subs. I am only against only-dubbed films, and wish for the option of subs! And all hail to Fansubbing as well!!! 11 responses to Viewers Against Only-Dubbed Films! 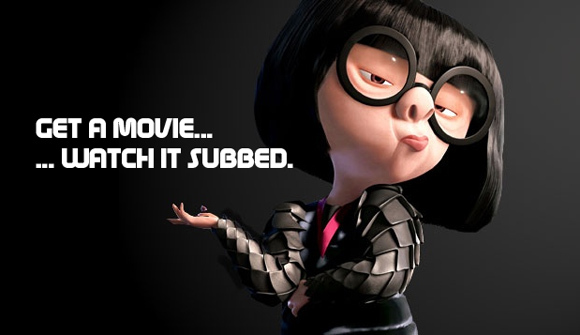 SUBS ALL THE WAY!!! The reason my english is perfect is thanks to swedish teve subbing everything!!!!! I agree with u when it comes to Spain, HP in spanish makes u cry and barf at the same time…. There has been only ONE instance when Spanish-dubbing worked for me. And that’s Goya’s Ghost. The reason I couldn’t stand watching Memoirs of a Geisha more times is that I just think Zhang Ziyi didn’t really work for me as Japanese poorly-speaking English. I can only forgive Gong Li for it because she learned to speak English for this… and her crazy Matsumomo (??) was good. That movie was so pretty, but could’ve been so much better with a Japanese-speaking cast. LoL U are so cute Amy-chun babbling on your own reply wall…..
Yo en lo personal odio leer películas subtituladas porque estorban en pantallas y muchas veces no traducen la idea como deberia ser o la transmiten de manera muy escueta. Yo lo que hago es que en el DVD pongo el audio en inglés y quito los subs. Pero q pasa con las peliculas en Aleman, Frances, Japones, Chino, etc etc? No me digas que tmb les quitas los subs?? O simplemente no los ves? Good Storytelling Goes Beyond Language?